Due to popular demand, we have put together a SEO step by step guide to getting your website ranking. This guide will teach you everything you need to know to about SEO. It is broken down into separate pages for each section. Click on the links in the table of contents below to be taken to a page on that topic. This SEO step by step guide has been set out in order, so be sure to visit every page for best results. Getting your website ranking in search engines can provide a healthy follow of online enquiries for your business. If your website is at the top of the search engine results you will receive a lot of traffic from potential customers. The more traffic your website receives, the more online enquires your business will get. The best thing about getting your website ranking in Google is it’s completely free. This makes it an enticing option for business owners that are on a tight marketing budget. The good news is with consistent efforts, you can get your website ranking above large companies in your industry. Quality of visitors: The quality of visitors refers to people having a genuine interest in your business. For example, if you own a restaurant call Blue Door Café, but a majority of your website visitors are looking to purchase doors for their home, then the website traffic is useless. Volume of visitors: The more people visiting your site the better, if they are potential customers of course. 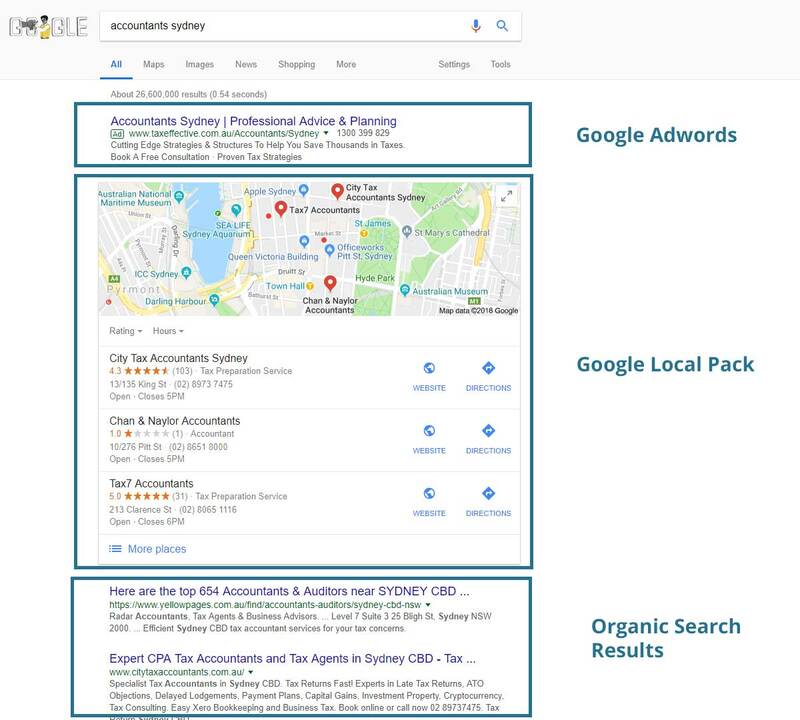 Below is a photo to show what the organic search results look like. Search engines such as Google, Yahoo and Bing use a crawler to gather information. The crawler travels from website to website reading and interpreting information that is then indexed on the search engines server. An algorithm then tries to match the indexed data with that of your search query. That is how the search engine works. The O in SEO refers to optimisation. Optimisation involves adjusting a websites code to help it rank higher for search queries that will provide more quality website traffic. Optimisation process involves researching, planning, implementing and reviewing to ensure the best results are achieve.